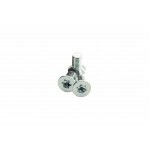 R150/170 WEPA PIKA OAZO Heel block adjustment screw. Highly sollicited if you use adjust the heel often, the screws on the plate can get worn out. The screws can be changed by a professional supplier with adequate tools. To prevent wear and tear on the screws always use a Torx 25 screwdriver to modify the range of the baseplate.